Works on Windows XP, Vista, 7 and 8 - both 32- and 64-bit versions. Converting your videos to play optimally on a device like iPad®, iPhone®, Nintendo®, Xbox®, mobile phones or media centers does not need to be complicated. 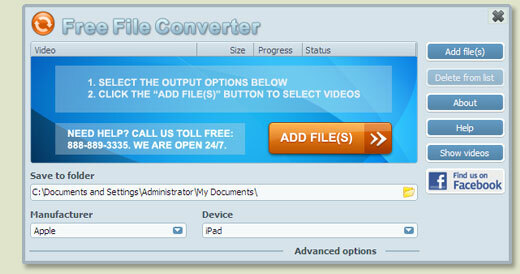 Free File Converter is a powerful video converter without a lot of advanced configuration options you need to know about. Simply select your output device, e.g. Apple® iPad®, and it will automatically find the optimal settings to use. Only two simple steps are required: 1) Select output device, 2) Select video files. That's really all there is to it! Oh.. and it's true: It's entirely free. No hidden costs. And many more like PS, Nintendo®, DVD, etc. This software uses code of FFmpeg licensed under the GPL license. The source can be downloaded here. 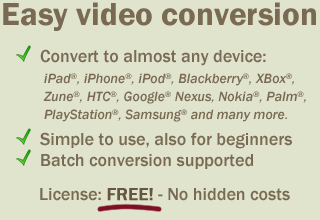 www.freefileconverter.com is in no way affiliated with any device manufacturer. All product-, brand- and company names may be the trademarks or registered trademarks of their respective owner.